MAY THE 4TH BE WITH YOU- SORRY HAD TOO!!! 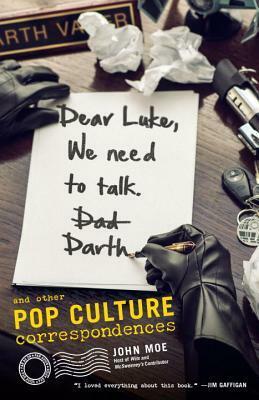 ‘Dear Luke, We Need to Talk, Darth’ compiles imaginary communications of pop culture figures in order to answer these and many other pressing questions. They’re short, easy to read and genuinely funny. Some were certainly more original than others, but there were a few real gems scattered among several clever pieces. ‘Dear Luke, We Need to Talk, Darth’, – this is basically a bunch of letters that Darth might have written to Luke and yet discarded without ever sending them. They are all explanations of how he is Luke’s father and his occupation is not ‘evil’ at all. He even warns Luke of ‘a princess whose hairdo looks like it was inspired by cinnamon rolls’ not to kiss her, and that he will explain later why. What if Gillian’s Island were a secret CIA experiment? What are Jay-Z’s 99 problems? What if there really was a Hotel California? Then we have the Jurassic Park dinosaurs holding a meeting, e-mails from the aliens that left E.T. There is an outlaw named Bon Jovi and a diary of Bruce, the shark for Jaws! What if we took pop culture way too literally?